Nun disguises as a boy and joins boy band. Lead singer is kind of a jerk, but hot. Do you need any more information? If you needed any more information after reading the summary, this might not be the dorama for you. However if that is your sort of thing, run, don't walk and watch this series!! It is one of the best there is. Anyhow, I dare you to watch the main character a) being thoroughly lost while wearing an Afro wig b) being unwittingly celebrated on his birthday by the nun c) creating his own fan club, and not be thoroughly entertained. Also, this series makes fun of boy band fan fiction, which is awesome. The making fun of, not the boy band fan fiction, which, eww! Also, fun fact: This series is very popular in all of Asia. 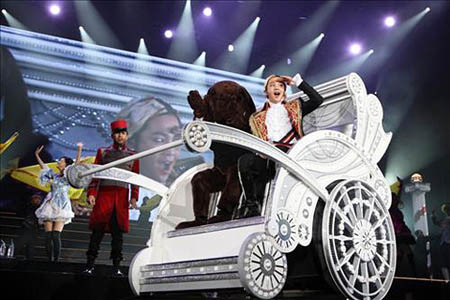 Which sadly did lead to the main actor's ego going wild, claiming himself "Prince of Asia", and entering stages in a giant ridiculous Cinderella coach. No, not making this up. However, do not make the mistake of thinking he will be adorable in all his roles (please neither watch Mary Stayed out all Night nor the Korean version of You are my Pet if you are not looking for serious disappointment). Due to its popularity, this series also spawned a Japanese remake which also should be avoided at all costs, as it stars the lead singer from Kismai, who is neither hot nor charming. Also, since it is half as long, it has none of the slow build-up of the original but feels like a "best-of" clip show replayed with mediocre actors.